Applications: Leather Sofas, Fabric Sofas, Car Interiors in Automotive Upholstery Industry, Upholstered Furniture, Jeans, General Upholstery Panels and Shapes, Leather Goods, Canvas and plastic, Handbags, Shoe Uppers, Leather or Synthetic Leather, Sports Apparatus, Medical Apparatus, Soft Cushions etc. 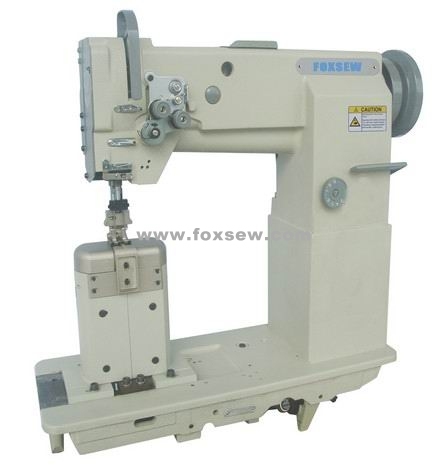 Features: This machine series is a new product series of FOXSEW brand post bed lockstitch sewing machine. It is designed with compound feed mechanism and post bed. It has three sub models of single needle left-side stitching machine, single needle right-side stitching machine and two needle post bed compound feed machine, to meet different demands from the market. Spacious operating room, flexible rotation, smooth sewing and beautiful are all attributed to the post bed. 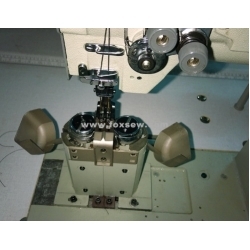 With turning block rotary hook’s lip, it is more convenient to change bobbin. 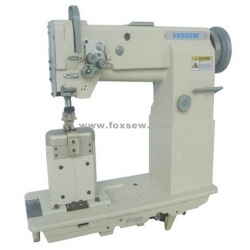 This machine series are available for sewing car seats, cushions, safety belts, safety airbags, automotive interior trim, handbags, bags and case, boots, etc. Standard: 12.7 mm, 9.5mm is available.